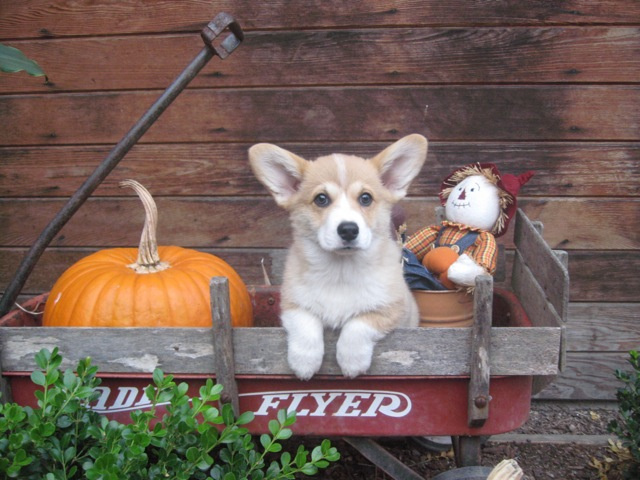 Reading back through the stories and looking at the pictures of our puppies growing up and having fun in their new homes reminds me of how much I love breeding corgis. I love sharing our puppy owners' stories and pictures so enjoy these. "Hi Peggy, Here are some recent photos. 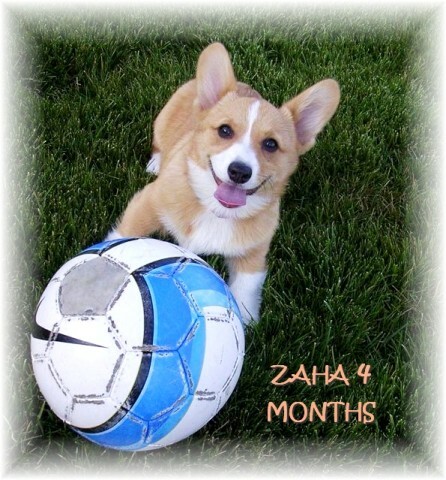 Zaha is taking after her brother with the love of the soccer ball. It's so cute watching her play. She is doing well in puppy class. The first class she was very shy and hid under the chair, but now she loves to play with the other dogs, especially the big, rowdy ones. Her favorite part of class is staying after class and make sure no food is left behind on the floor. She is making friends wherever she goes-people can't get over how cute she is"
flora is doing so well. she is growing up so quickly but still very petite which is great actually. she's 10 months now and weighs just under 16 lbs. we are having LOTS of fun with her. 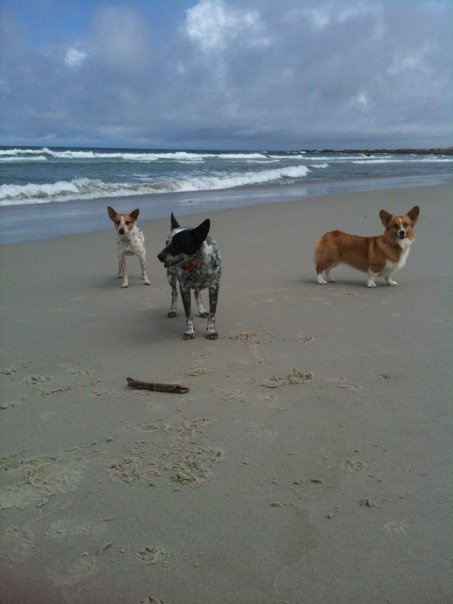 we're heading to carmel this weekend so she can frolic at the beach, her very favorite thing to do! Hope this finds you well. We are still completely enamored with our little Flora. She's just wonderful, adorable, good natured... I can't believe she's nearly 4 already! 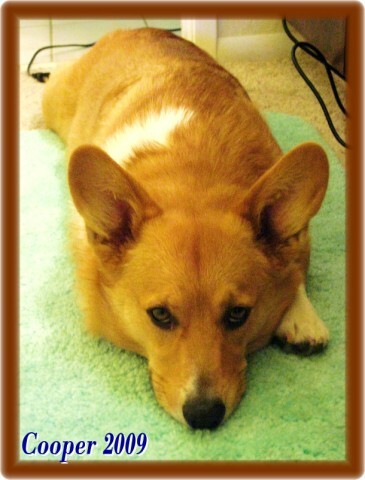 Just wanted to let you know Enzo is a charming, quirky, intelligent Corgi. He is a joy to our home and family and we are more then thankful to have him in our life :) Enzo is so outgoing and adventurous he accompanies us from running errands to hiking down the river. He loves his little red cape, he runs up and down the stairs to get wind under it. 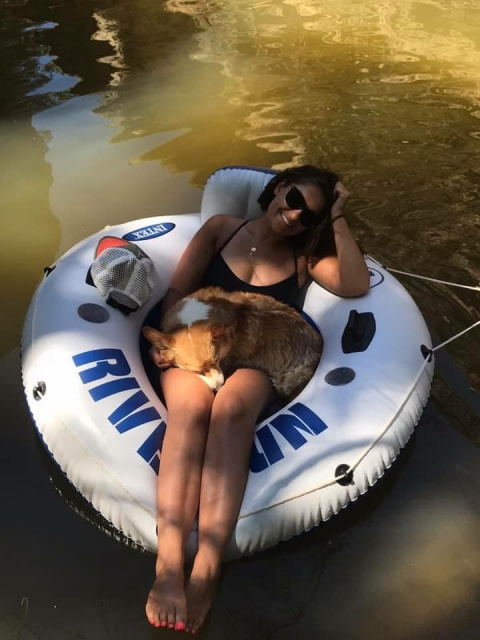 I had the great privilege of adopting a male, Corgi puppy from you back in April of 2007 and I thought that I would take the time to send you a little update via email. :) My little boy, Cooper, is all grown up and doing very well. Cooper has such great energy and always accompanies me on walks, runs, and sometimes even drives around town. Every two months I take him back up to Grass Valley and he stays with my mom for two weeks. My mom has three horses for Cooper to herd and 6 acres of land for him to run and play around. By the time I take him back to the Bay Area at the end of his two week stay he is exhausted. Along with this small update I wanted to be sure and take a moment to thank you again for paring me with such an amazing dog. Cooper is one of the best dogs that I have ever had and everyone who meets him falls in love. I recently ended a 5 year relationship and Cooper became my best friend and support system. Now I really don't know what I would do without his companionship. 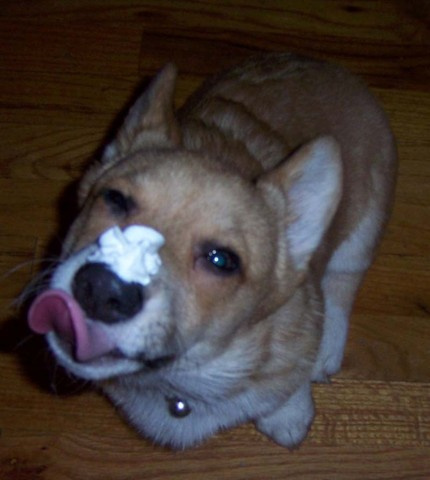 The overall quality of your line of Corgi's is remarkable and I would highly recommend you to anyone interested in the breed - in fact I have given out your name to a few people. :) Thank you again for blessing me with one of your amazing puppies. I hope that you and your family (and all of your doggies) are doing well. I hope to stay in touch. Thank you! Thought you might like some updates on Dylan. He is doing great! He is the best....and is he smart. He has learned the names of 5 different toys and will bring the one you ask for. He does the obvious sit, stay, come, down very well. 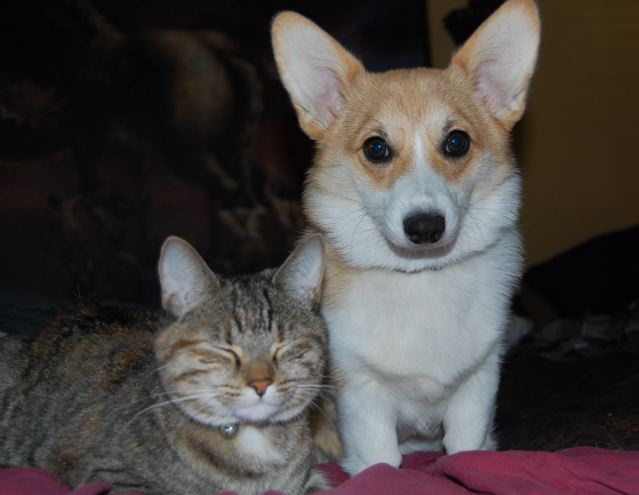 The dog/cat relationship is greatly improved and is almost comical when they are together "playing". He loves going to the beach for walks, dog park with the other dogs to play and recently tried an agility course at a friends house...of course he was the best one there. He really seemed to like it...we are going back to do it again real soon. I have included some pix of Dylan....some are with my daughter who is visiting. Thanks for introducing Dylan to us....he is very loved. It's been a while since I've told you about Peaches, so I thought I'd do that really quickly. I always want to wait until we have pictures, but we are always so slow to get them from the camera, re-size them to send out, etc. I've got one picture of her from last week and I'll try to send you more later. Life with her has gotten a lot more fun in the past few weeks because she received her final shots and we've been outside. We went to Crissy Field for almost 2 hours this morning. She chased birds in the grass, fetched on the beach, and generally became quite filthy. I gave her a bath and she's outside chewing on a stick I gave her and drying in the sun. She's fantastic at Crissy Field. I let her off leash and she listens incredibly well. Much better than she does at home. I guess I am quite happy that she knows to come when it matters out in the wild. And she's definitely listening better indoors. Peaches is more or less the "belle of the ball." People will stop their car to ask us about her or cross the street to pet her. She loves little children, adults, and other dogs. She's quite feisty! I've watched her go toe to toe wrestling with huge English Bulldogs, Golden Retrievers, or little Norwich Terriers. She is apparently building a good reputation, because everyone at the park (including people I've never seen before) always go "Oh, it's Peaches!" She was about 11 or 12 lbs. the last time we were at the vet, so I'd wager that she's about 13-15 pounds now. She seems nice and slim with just a little puppy fat. We walk her every morning and often in the evening, though sometimes she's pooped and less interested. We try to give her a good romp at Crissy Field once a week, though she went twice this weekend for the holiday. That means two baths. She's incredibly soft and has really cut back on the teething. She still does it a bit and will continue to, but she's usually much more tired or eager to please and be sweet. The attached picture is her last week with her new favorite stick. My team at work just finished our latest game. We held our ship party at a local park, so I brought her along for the ride. No way I'm going to miss an opportunity to let her get pooped and socialize with tons of people. Plus, everyone I work with loves her and tells me to sneak her into work practically daily. The stick she has is twice as big as she is, which makes it hilarious to watch her try to carry it around. She likes to hide her favorite toys. We started puppy training last week. Peaches is definitely one of the busier puppies. While walking, I constantly practice sit, lie down, and stay with her. I also try to exercise "come" constantly. I consider that and sit the most important. 5:45 am every day (her pick, not mine) and start exploring. She's a great little dog. I cannot wait to get a second one at some point. On the eve (just shy of 2 weeks) of her first birthday, I wanted to send you a few pictures that are a bit more recent. Attached you'll see her sitting in her favorite chair (in her ridiculous pose), trying to steal a Christmas decoration, pumpkin picking (october), and a handful of pictures of her after some "exhausting" walks. She's a wonderful, adorable, stubborn little dog. I think she's around 25 pounds, though I'm not sure. She's very fit and almost seems muscular around her front shoulders. 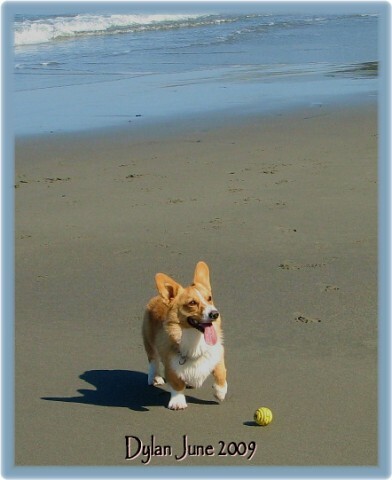 She runs with us every morning and chases the soccer ball every week at Crissy field. She's quite the 3 inch legged athlete. I think we want to wait a few years, but we've already picked out a name for our next one. I think we want to get another orange and white one. Watson is doing really well. He gets to spend time with my mom's two Aussie Shepherds whenever we go over to her house. He is spoiled rotten with fun toys to play with and lots of time with us. Since we both have to work, or go to school, during the day, we have him trained to use puppy pads. I really want to start getting him off of the pads, but we are waiting until he can hold it for longer periods of time. He is stating to get there. He is well trained so far and responds to come, sit, shake, roll over, leave it, and we are working on "go get your leash." He is so intelligent and loves to be challenged. Yesterday, we learned that he can also play hide and seek. Josh throws his ball and runs to hide. Watson gets his ball and then searches the living room for Josh. He has a pretty good sniffer and it only takes him a few seconds to guess where Josh is. He is so beautiful and healthy. We are feeding him a half a cup in the morning and a half a cup at night. He gets ample amounts of carrots and green beans throughout the day as treats. His color is gorgeous and we get tons of compliments on him everywhere we go. Here are some newer pics of our boy. The first few are of his first day at Carmel Beach and him taking a nap with his best friend, Teiwa, and the other is Halloween at the Barnyard. Oh, I also threw in an "after bath" pic. He loves baths because he gets to tumble around in the towel after it is over. I'll try to take a little video of Roo this weekend and send it to you. He is SUCH a character. His presence fills our house! My sister has been visiting us for the holidays. She's always has Aussies and never glanced at smaller dogs. 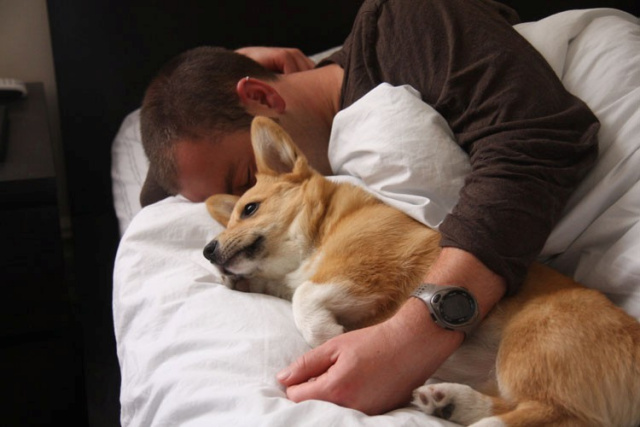 Now she REALLY wants a Corgi. There is nothing "small" about Roo. He is very tenacious. He gallops gleefully into any new experience. He LOVES our hikes up the hillside. He was the star at our staff party at the bakery. He loves people and seems very confident around other dogs. What I most like about him is that he is so comfortable with himself. "What you see is what you get" with him. No peeling the onion here. I would not call him head strong, rather I would call him bold. He's is very fun to work with as he will do ANYTHING for a treat and already has his basic obedience well under study. Pika is quite content as she now has Roo firmly established at the bottom of her priority list. Secretly, she is quite interested in him. There's been no fighting. She's just "a bit above" his puppy romps. Pika has always been very dignified and takes protecting her farm very seriously. Roo is a bit of a goofball in her book. I know they will end up bonding just fine. Timmy thinks Roo is the greatest gift we have ever given him. They play constantly. Roo has no trouble holding his own with a very active, happy border collie. What more can I say? What a great dog. Gracie is absolutely a WONDERFUL dog. We adore her, me to the point where it is slathering and obnoxious. If I had a doll buggy it wouldn't be out of the question. So of course she doesn't come when she's called, etc. I think we need to get a little more tough.....damn that's going to be hard to do! One of the things we have to be most thankful for this year is fate bringing you and Gracie into our lives. She has more toys than any dog in the world, and we love her dearly. Chief is doing great. He is a wonderful addition to our family. Here are a few photos of him when he is sitting still!